The U.S. Supreme Court heard oral arguments on Wednesday, Oct. 10, in the first case the Court has taken up in nearly a decade on the use of race in higher education admissions. The Court was petitioned in February this year to hear Fisher v. University of Texas, which could be a precursor to a shift in affirmative action and how U.S. colleges and universities use the race of student applicants to attain higher diversity on campuses. The court challenge comes from Abigail Fisher; a white student denied admission to the University of Texas at Austin in 2008. The University automatically admits the top 10 percent of academic performers from state high schools and then considers the race of applicants in admitting the remainder as one of about a dozen additional “filters.” Fisher, who did not finish in the top 10, maintains that the race consideration blocked her admission. The University, backed by civil rights groups such as the NAACP Legal Defense Fund, argues that many of its classes would have few minority students without the additional race consideration. The case generated over 92 amicus briefs, one of the highest in Supreme Court history. On August 9, academics from 172 universities and research organizations in 42 states joined in one brief submitted by the Civil Rights Project, which focused on research that indicates without race-conscious admission policies, universities would lose educational diversity which “race-neutral” alternatives can’t achieve. At a forum held by the American Educational Research Association on September 27, Dr. Gary Orfield, a Professor at UCLA and co-director of The Civil Rights Project, reiterated that the Court should continue to allow race in college admissions because it achieves diversity in ways that class-based affirmative action policies don’t. Earlier, on September 21, the Brookings Institution hosted a half-day conference that examined, among other research, the harmful effects on students of race-based affirmative action that result in a “mismatch” phenomenon where minority students with weak academic backgrounds struggle in a more competitive university situation and so reportedly do not try as hard. The Fisher v. University of Texas case is different from when the Court upheld race-conscious admissions in 2003 at the University of Michigan Law School in Grutter v. Bollinger. When Barbara Grutter, a Michigan student with a 3.8 GPA, was denied admission, she alleged her rejection was based on race. The School argued they needed to ensure a "critical mass" of students from minority groups. Conflicting lower court rulings brought the case to the Supreme Court which issued a 5-4 majority ruling, written by then-Justice Sandra Day O'Connor, which noted the Constitution does not prohibit “narrowly tailored use of race in admissions” to further the educational benefits “from a diverse student body." 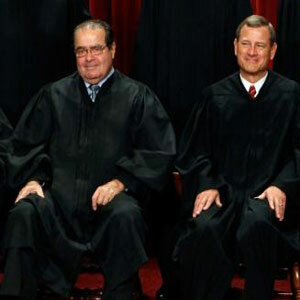 This concept of a “critical mass” of minority students came under particular scrutiny from conservative justices, including Chief Justice John Roberts and Justice Antonin Scalia, during Wednesday’s hearing, according to the transcript of the oral arguments posted on supremecourt.org. “What is the critical mass of African-Americans and Hispanics at the university that you are working toward?” Chief Justice Roberts and others repeatedly asked the University of Texas lawyers. The lawyers would not answer with a specific number, presumably because the court has rejected racial “quotas” in the past. The current Court's decision to revisit race-conscious college admissions nine years later indicates that at least four members of the Court, which now lean more conservative on race matters since Justice O'Connor’s (who was in the audience on Wednesday) retirement in 2006, believe the issue is worth review. O'Connor’s replacement - Justice Samuel A. Alito Jr. - has been openly critical of affirmative action and Justice Anthony Kennedy dissented from the 2003 opinion in the Grutter v. Bollinger case. Justice Elena Kagan, considered one of the Court's liberals, is sitting-out Fisher v. University of Texas on the grounds that she was the Obama administration's solicitor general when the Justice Department sided with the University of Texas in the lower courts. This means there is a slight possibility of a 4-4 split by the justices in the case, which would leave in place the lower court’s decision in favor of the University. In a written statement released by the Virginia-based Project on Fair Representation after the hearing, Abigail Fisher said, "My parents always taught me that it is wrong to discriminate. I hope the Supreme Court will decide that all future University of Texas applicants will compete without their race or ethnicity used in the school's admissions process." A ruling is not expected until next spring or summer. We discussed this subject at length in my Intercultural Communication class and it really opened my eyes to a number of different opinions on this matter. One thing that we discussed was the fact that we go to a very diverse University so our views may be skewed, but most of us also agreed that race should not be a factor in college admission mainly because your race should neither hurt you or help you. In my personal opinion race should not be used at all in college admission mainly because I believe my race hurt my ability to be accepted into some schools. I worked really hard in high school, got a 4.0, lettered in three sports, was the president of three clubs, and was class president my senior year. When I applied to schools I had a friends who had a worse gpa than I did and no extra curricular activities but she is considered a minority and I believe that is the reason she was accepted to schools that I wasn't. For that reason I believe admission to college should be completely merit based and race should not even be considered.